Beguiled, my new collection of novellas and short stories, is available today! I don’t write a great many short stories, although in assembling this collection, I have to wonder why that is. A shorter work is an opportunity—if not an invitation—to try something different in terms of style or to play with an unusual idea. Short stories are fun to write for that reason, and in addition, offer different structural challenges than books. I love to read short stories: they can be tantalizing in themselves, and also can provide a telling introduction to an author’s work. The works included here were all written as the result of an invitation for me to participate in an anthology with other authors. In the past, invitations have been the only reason I wrote short—though that might change! I was glad to be invited to participate in all of those volumes, but is often the nature of short stories to remain available to readers for only a limited time. So, I’m very pleased now to have the opportunity to pull these works into a collection of my own and make them available to you again. In addition, putting the stories together makes their similarities to each other more clear. Most of these works have a medieval setting, and all of them include both romance and fantasy elements. Each of them features a strong heroine who makes a choice, a choice that might end up costing everything she holds dear. Historians called the ability to influence one’s own situation “agency” and it’s an idea that I like to explore in all of my work. In the medieval era, women had more agency than many people believe, and we, too, have agency in our era, although maybe it’s less than many people believe. What we choose and why fascinates me. For the women in these stories, the opportunity to choose is more important than the result: I don’t know that even Melusine would regret her decision, though the end result is not what she had hoped to gain. I’ve included an introductory note before each story, telling you a bit of how it came to be and its history. I’ve also included an excerpt from my medieval romance, The Rogue, because in reviewing these shorter stories, it’s clear that Alix and Melusine led me directly to Ysabella. Finally, there’s an excerpt from my upcoming medieval romance, The Frost Maiden’s Kiss. This is the third book in my True Love Brides series, and features the return of Malcolm to Ravensmuir from his time as a hired mercenary in Europe. He’s earned a fortune, but believes it has cost him his soul (and possibly his sanity) until he meets Catriona, a woman who shows him how to rediscover goodness. Catriona, however, has dangerous secrets of her own, ones that can threaten everything they build together. Malcolm and Catriona’s book will be published in August 2014. There are pre-order links available for Beguiled on Kobo and iBooks right now. There will be a pre-order link at All Romance eBooks in about a week. The book will be available on Amazon, B&N, and Createspace on July 24th, then availability on the print edition will perk out to other portals over the following week or so. It’s that time again—the first of the month means a new reader contest. This month’s prize is a signed trade paperback copy of Beguiled, the new collection of my previously published short stories and novellas being published this month. As usual, the contest is open internationally and, as usual, I’ll add another prize for every 25 entries. Good luck everyone! I have a new title on my upcoming releases schedule – it’s a collection of my own short stories and novellas, called Beguiled. This volume will include six shorter works of mine that have been previously published—they’ll all be together in one volume for the first time. It’ll be released in both print and digital. A medieval fantasy novella with romantic elements, originally published in the anthology To Weave a Web of Magic. A short fantasy story, previously available in a digital-only edition. A medieval romance with fantasy elements and a short story, originally published in the Mammoth Book of Irish Romance and later published as a digital-only short. It’s also included in the trade paperback edition of The Snow White Bride. It was edited in MBOIR for space constraints but appears in its entirety in all subsequent editions (including this one). A medieval romance and short story, originally published in the digital anthology Seven Deadly Sins and subsequently published in a digital-only edition. A medieval romance novella with fantasy elements, originally published in the anthology The Queen in Winter. A vampire romance originally published in the Mammoth Book of Vampire Romance II and later available as a digital-only short. I’m thinking this will be a July release, but will confirm the date closer to publication. I’m in the queue for a new cover! I think getting a box of books is my favourite part of being an author. 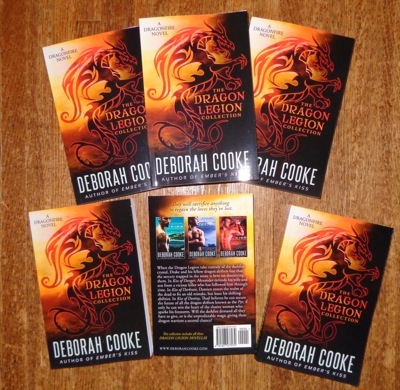 Today, my copies of the Dragon Legion Collection arrived, and they’re just beautiful. Look! I owe copies to a number of you, so now that my books have arrived, I’ll get yours into the mail to you.